Concept Brainstorming based on sucessful long-term engineering experience in order to prepare the most suitable technical concept and most economic commercial proposal. 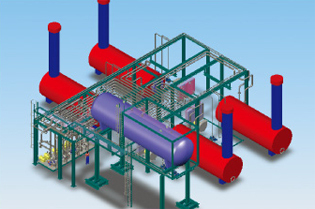 Our design department provides 3D-design and engineering drawings, calculates and simulates fluid stream inside heater, using special software to guarantee the safety of system. Thermal Calculation at its best is supported by using up-to-date software tools. Furthermore, our own tools are developed, founded on the advances of the in-house research and development. 3D-Design with highest performance based on SolidWorks and upgraded by our own designer and linked with our commercial management database. Manufacture Using the smartest technologies and procedures for Bending, Cutting, Welding, NDT, Wiring, Configure, Adjust, Simulation, Testing. 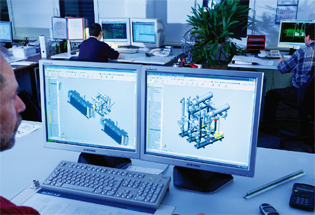 Control and Interface Automation- and Control-Design for a safe and smooth operation and monitoring. AURA is holder of all national and international quality certificates and approvals for offshore. Highest quality standards in design and manufacturing acc. to DIN4754, VDI3033, TUV, AD2000; as well as quality control and certified quality management systems (ASME). To guarantee a long lifetime of the system even under such extreme conditions as marine or desert conditions, safe and durable systems are designed strictly according to customer’s request. All components are easily accessible, mounted to a steel skid, pipe-connected and quality-checked. The electrical devices are connected, configured, and performance-checked. The connection points to the on-site equipment are also easily accessible, and the connections can be made without effort. Safety and short assembly time are ensured by electrical wiring and complete quality checks in the workshop.